We hosted a halloween party. At a local park. 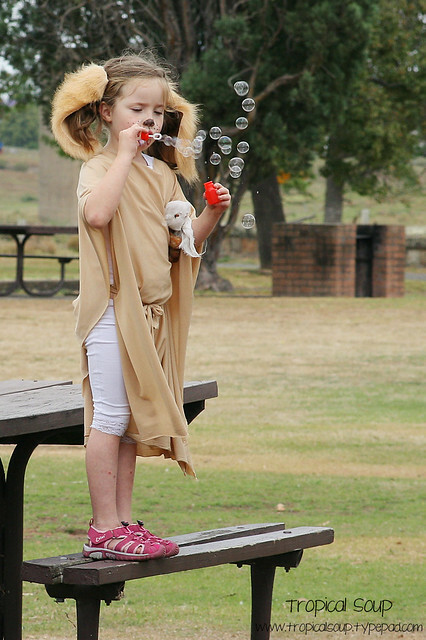 It was awesome - an actual kangaroo (complete with joey) even showed up to disrupt an impromptu soccer game! For the month prior, both kids had been dead set on dressing up as a mummy (Immy) and a spider-ghost (Cole). I tried to roll with the punches (and *not* stay up all night making costumes!!!) when they came to me on Friday with completely new ideas. And so I present to you Imogen the golden retriever (at least she's specific, ha!) 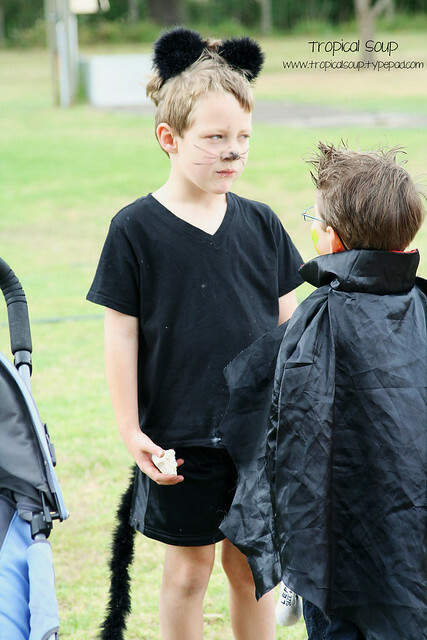 and Cole, disguised as his very own pet black cat, Mahe! And whilst my last minute costumes did the trick, they aren't particularly noteworthy. 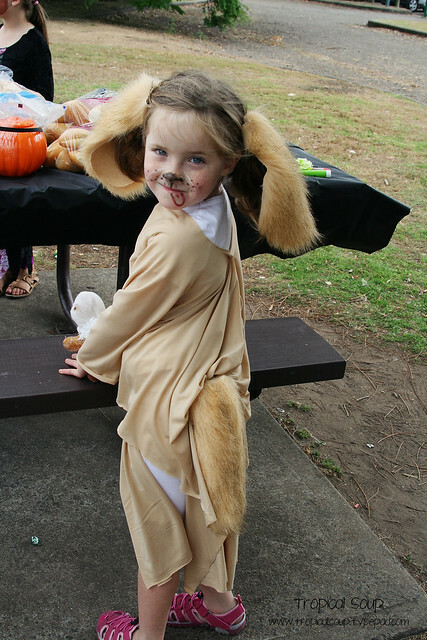 There was one that is worth mentioning though - in Immy's arms in a few of these, you can see a little white bundle - that's her beloved Ginger Kitten softy, donning an entirely Immy-made ghostie costume fashioned from muslin, tied on with hair bands and with slits for eye holes. I love that Ginger Kitten is such a part of our wee family that a costume for her goes without saying...even if she did rather resemble an unfortunate victim of the kkk! Several ghosties were sacrificed and worn around on Cole's front!!! 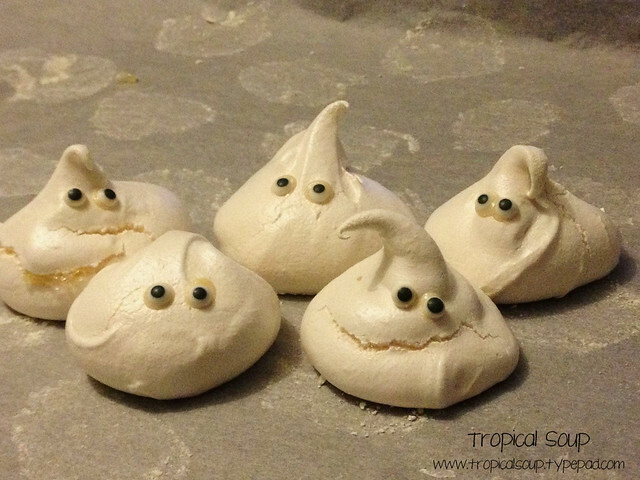 In keeping with my usually dismal record of photographing event set-up, the meringue ghosties are the only photos of food I took...so I'm afraid you'll just have to use your imagination for the used bandaids, mummy dogs, cheese ball bats and other revoltingly delicious concoctions! 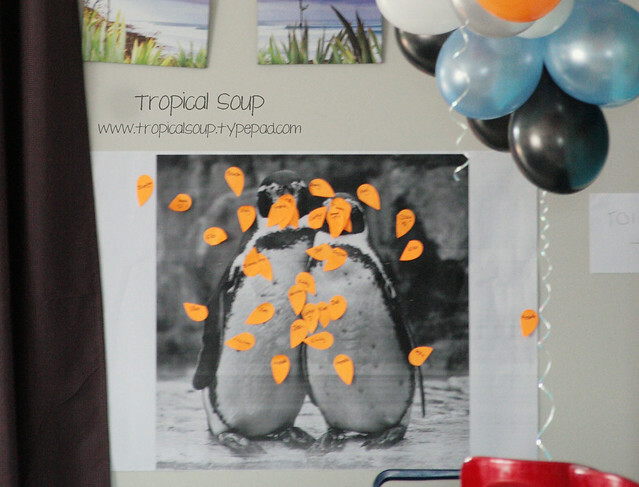 ...And lest you think the only thing at the party was food, here's our version of *pin the beak on the penguin* (it was a penguin party, in case you hadn't noticed!!! 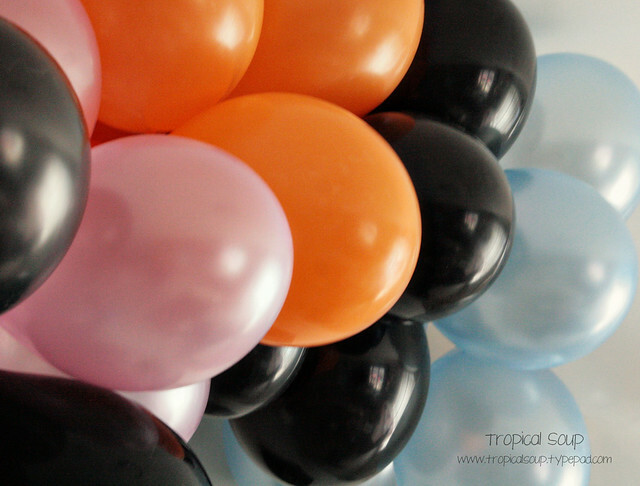 )It proved to be insanely popular, and would be very easy to replicate for any party. I found a copyright free image online, and took it to Officeworks where they printed it onto Plan paper for me - it's only available in Black and white, and because the image was embiggened so much it did have a little pixellation, but then again, it was blown up to A0 size, and cost less than $6. Awesome! I found some bright orange post-it notes that were shaped like hearts, and I just cut the hearts more-or-less in half, so they looked beakish. And then, as each child placed their *beak*, I simply added their name with a sharpie. I didn't do a prize for the closest beak...the deal with the games at the party was that everyone got a prize if they'd had a turn/tried something (one prize per kid, not per game - I guess it was an alternative to party favours? ), which meant everyone was happy and there were no dramas about who had an advantage etc etc, especially as we had kids from 2 to 8 playing along. 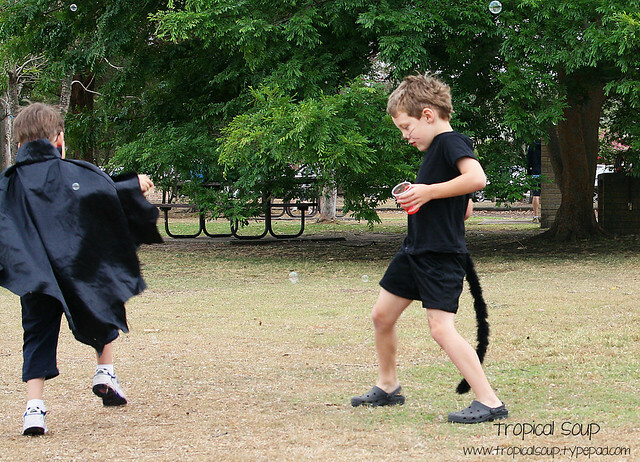 As the mother of 2 naturally competitive little souls (who inherited that spirit in equal measure from both paretns! ), I have definitely learnt the value of encouraging something for the joy it brings rather than (just) the goal of competition. Thank you Montessori for yet another important life lesson! The *prizes* - indian rubber balls, cute post-its, yo-yos, fun pens and pencils etc, and lollipops - were all tossed into a pillowcase and each child reached in and grabbed something without looking. If the first thing they'd selected wasn't to their taste, they got to put it back and have another turn, but they had to keep their second selection. (I modified this for the little ones - they could see into the pillowslip) Funny thing - everyone wanted the 2c lollipops, which I only added as an afterthought in case the *good stuff* ran out. We are now well stocked with yo-yos and cute post-its, ha! This old favourite was so popular and most kids had multiple turns....in fact I may or may not have hidden the rest of the *beaks* after the first 100 were used (there were fewer than 20 kids at the party all told...and the picture above was taken after I'd removed at least half, phew!) This is definitely a great job for the fun auntie/grandpa/etc who wants to help!